Visiting the eloquently designed National September 11 Memorial was a sobering and emotional experience. The almost overwhelming sense of loss is magnified by the massive reflecting pools marking the voids where the twin towers once stood. Designed by architect Michael Arad and landscape architect Peter Walker, the 9/11 Memorial is a site of tribute and remembrance to the nearly 3,000 lives that were killed in the September 11 terror attacks. The eight-acre quadrant features twin reflecting pools–each nearly an acre in size–that also hold the largest manmade waterfalls in North America. The names of every person who died in the 2001 attacks and 1993 WTC bombing are engraved along the edges of the Memorial reflecting pools. A lush and minimalistic landscape design supports the architecture and pools. Reflection of the Freedom Tower in the Museum window, which is set to open next year. From the north pool, looking at the Museum. The names circling the pools are a reminder that this is a place of mourning, a memorial to those that lost their lives and to those as part of the first responders. This concludes my landscape architecture travel series around New York City. 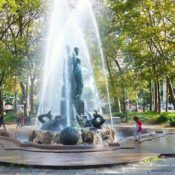 Thank you for taking the time to read, and hopefully learn about some of the city’s unique parks and urban designs! Please feel free to share your thoughts in the comments below. In today’s NYC travel installment, landscape architect Jeff Gonot takes us deeper into Brooklyn to visit Frederick Law Olmsted and Calvert Vaux’s other crown gem in New York City: Prospect Park. A 585-acre green oasis located in the heart of Brooklyn, the expansive park welcomes over 10 million visitors a year. Since I first read about Prospect Park in Genius of Place, a biography on Frederick Law Olmsted, before visiting, I was able to have a deeper appreciation for the work that Olmsted and Vaux crafted. They designed quintessential forms of American landscape architecture with architectural elements that arose naturally from the landscape. Though I wasn’t able to explore Prospect Park as much as I hoped (the botanical gardens were under construction), studying the park’s history prior to arrival enriched my experience at Prospect Park. I highly recommend taking a bike ride around the park or spending an afternoon with friends in the great lawn area as a way to enjoy a slice of the park-rich New York lifestyle. 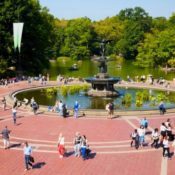 No trip to New York could be complete without a visit to Central Park, one of the world’s most popular and best-recognized parks. In preparation for my trip to New York, I read Fredrick Law Olmsted’s biography Genius of Place to give me a better understanding and appreciation for his work. After years of hearing about this park and seeing it in film, television, and my college textbooks, the chance to finally visit Central Park put me in a great state of bliss. “Central Park was the first landscaped public park in the United States. Advocates of creating the park–primarily wealthy Skating in the Park Skating on the Lake in turn of the century Central Park. merchants and landowners–admired the public grounds of London and Paris and urged that New York needed a comparable facility to establish its international reputation. A public park, they argued, would offer their own families an attractive setting for carriage rides and provide working-class New Yorkers with a healthy alternative to the saloon. After three years of debate over the park site and cost, in 1853 the state legislature authorized the City of New York to use the power of eminent domain to acquire more than 700 acres of land in the center of Manhattan. Entrance to the Ramblas and fountain. The arches, and to a greater extent, the architecture, was designed by Calvert Vaux. Frederick Law Olmsted teamed with Vaux for the design of Central Park and many of America’s finest 19th Century parks. See City Beautiful Movement and Chicago’s World Fair of 1893 for a better understanding of what these two great men accomplished in developing an American identity through landscape design and architecture. From under the arches looking to the fountain. An iconic rustic walkway meandering through the park’s landscape. Main walkway through the heart of the park. An indelible masterpiece of Vaux’s architecture. There are so many areas of the park that I didn’t get to explore. There is always next time. See where else Jeff’s traveled to in the NYC Landscape Architecture Travel Series. With its great sun-kissed lawn flanked by a collonnade of London Plane trees, Bryant Park ranks high on landscape architect Jeff Gonot’s list of favorite places he’s visited on his trip through New York City. People were everywhere in the park: playing chess, bocce, ping pong; reading from the outdoor library; and relaxing away from the hustle and bustle of the city on a peaceful afternoon in the park. Although the lawn was closed on my visit, it didn’t put a damper on my experience. It was still a flawless afternoon in a perfect urban park. For landscape architect Jeff Gonot, Paley Park is the epitome of urban design. After spending an afternoon there sketching and absorbing the many elements of the inspiring pocket park, he writes: Everything about the space is perfect. 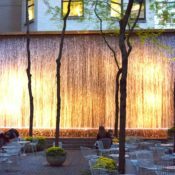 A small pocket park nested in the heart of midtown Manhattan, Paley Park is a celebrated and lush urban oasis surrounded by high-rises. Created after its benefactor, William Paley, the beloved park was immortalized in William H. Whyte’s famous film The Social Life of Small Urban Spaces. Completed in 1967 and designed by Zion and Breene Associates, Paley Park has been lauded as a successful example of a privately owned public space. A 20-foot tall waterfall creates a dramatic focal point that draws pedestrians in and provides a blanket of white noise to create a sense of privacy. Lush and dense ivy crawl up the walls and 17 honey locust trees create a gorgeous thin canopy with yellow and green dappled shade. Moveable wire mesh chairs and marble tables give users freedom and control over the space. A tiny cafe sits in the corner selling food; the tiny park is a popular and often crowded luncheon spot. Despite its size–Paley Park is but one-tenth of an acre–the park leaves a lasting impression. Paley Park helps us to better understand human scale in relationship to the greater whole, the city. What a masterpiece! All images © Jeff Gonot unless otherwise noted. 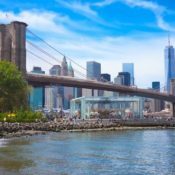 This week, Land8’s NYC travel series kicks off in Brooklyn, as landscape architect Jeff Gonot takes on Brooklyn Bridge Park. Read on for his travelogue! Open space with Manhattan Bridge in the foreground. It was a warm and beautiful sunny day when I visited; the food trucks were out and so were the colorful crowds. It’s hard to imagine now, but it was only a short while ago that the river and harbor front of Brooklyn, Manhattan, Newark, and Long Island City were considered an industrial eyesore. 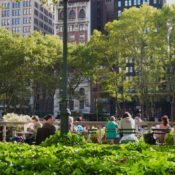 Thanks to Mayor Bloomberg’s revitalization efforts, however, the city has now become home to some of the greatest parks and urban spaces in the world. We commend you Mr. Bloomberg! The Lower Eastside beyond provides a marvelous view. Re-purposed stone creates these steps down to the waterfront. An eclectic and diverse landscape, with Lady Liberty in the horizon. A look back at the Lower Eastside with the Freedom Tower rising high above the skyline. Wondering where else Jeff Gonot’s been in NYC? Check out his posts on the High Line and Four Freedoms Park! Join landscape architect and Land8 member Jeff Gonot as he continues on his adventures through New York City as part of Land8’s new Tuesday Travel series. Today, Jeff takes us on a visit to the Louis Kahn-designed Four Freedoms Park, an enduring and uplifting tribute to the life and work of President Franklin D. Roosevelt. 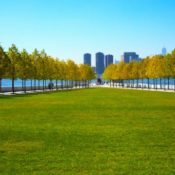 Located along one of NYC’s most dramatic waterfronts, the triangular, four-acre space replaces a former landfill with a pristine, meditative park that has been compared to a walk-in sculpture. Dedicated to FDR and his beliefs in the Four Freedoms, this recently completed park sits at the southern tip of Roosevelt Island, where it provides a vast reflective space. Upon entering the site, white granite rises dramatically above the horizon. Closer still, one can read the words spoken by the 32nd president engraved into the steps. After ascending the stairs, a lush green lawn spills out to the south, lined by trees that frame the focal point of FDR’s oversized bust. The park offers sweeping, panoramic views out towards the city skyline, creating a stunning visual experience. Welcome to Colorado, where natural and urban landscapes are your playground to explore. Denver, and Colorado for that matter, is a unique, naturally beautiful place. A 30 minute drive from downtown puts you in the foothills leading up to the Rockies in towns like Boulder, Golden, and half way to Colorado Springs to the south or Fort Collins to the north. Recreational opportunities abound and in many parts of the city too. One of the best things about the region is that Greater Denver brews the most beer per capita than anywhere else in the United States. So if you like beer while exploring natural and urban landscapes, go to Colorado! While venturing through the city, one particular thing stood out, which were the perennial beds potted throughout downtown and in outlying communities. Reminded me of Magnificent Mile in Chicago with its striking flower beds along the pedestrian friendly streets. One of the first stops while exploring was Confluence Park, which is located at the northwest part of downtown Denver on the Platte River. Rocks were constructed to direct flow of the water to create rapids. Throughout the day, use of the site increased, ranging from kids, couples, and groups of bike riders. For more information on Denver parks please visit the website here. After visiting the flagship REI store near by, began the trek to downtown to check another Lawrence Halprin design off the bucket list, and that would be Skyline Park. This is quintessential Halprin, as expressed through his other west coast projects like Levi’s Plaza and Vaillan Court Fountain in San Francisco, and Keller Fountain Park in Portland, Oregon. Along the walk to the next destination there were more perennial beds. In order to get to the capital building and its great lawn, one has to walk down the pedestrian-friendly 16th Street Mall. This almost curbless pedestrian-oriented street reminded me greatly of places like Barcelona’s La Rambla and Santa Monica’s 3rd Street Promenade. Once at the end of the pedestrian mall, the capital building begins to reveal itself. Unfortunately at the time, the building’s dome was under construction. Near the capital is the Denver Art Museum with its space-like addition designed by architect Daniel Libeskind and an art sculpture by Claes Oldenburg & Coosje van Bruggen. Over the course of the next few days, trips to the outlying towns were made and fun was had. One place high on the list of things to see was Red Rock Amphitheater near Golden. Truly an unbelievable landscape, albeit man-made, but you can’t take that away from the experience of being there for a concert or show. Its sheer scale is captivating. Took a hike to Royal Arch and spent the day in Boulder. What a view from the top of Royal Arch to the landscape beyond. If you love hiking and the outdoors, its a must. On the return trip, stumbled upon a makeshift Flinestone living room. 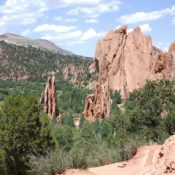 Last, but not least was the spectacular day trip to Garden of the Gods near Colorado Springs with Pikes Peak looming in the background. Hopefully these images portray Colorado well and that it entices you all to explore its natural wonders. Happy exploring! Landscape architecture is a multi-faceted field that requires its professionals to draw knowledge from all over. Those within the profession know that one can not be experienced or knowledgeable in one area alone. From soil science to plant botanical names to site planning and grading, those plying this trade need to know a lot about a lot of things. 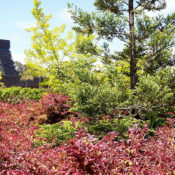 In order to gain experience, designers, horticulturalists, and planners alike are now using data and statistical information to make stronger, more environmental, efficient designs. Thanks in large part to advances in technological devices, big data has become a by-product of that. Professionals in landscape architecture have been putting this data to work in many ways. The following are examples and case studies of how and where this is occurring. There is no place better to understand big data than in the classroom with hands-on experience. In 2012, President Obama passed an initiative that opened large amounts of previously withheld data. Along with that the administration more recently expressed the relevance of big data in our society by releasing it to the public. A benefactor of this is the University of Virginia. “The [Architecture] School manipluates large data sets, especially through visualization processes like GIS and BIM,” says School of Architecture dean Kim Tanzer. “We generate visual representations of data, useful in understanding quantitative information. And we use large data sets to design by prescribing data-driven parameters to inform design choices.” Furthermore, Tanzer continues by highlighting when landscape architects use different parameters illustrating how land areas might change as a result of different sea-level rise scenarios or how a neighborhood would change as a result of population growth or loss. Continuing the trend of open sourced digital data, a recent ASLA interview with Suzanne Blier explains her work with WorldMap, a free GIS-based program that allows people to create their own maps with overlays filled with data for free. All of this would not be possible if it were not for the likes of satellite imagery sources, like USGS and Google Earth. GIS continues to show its importance in the profession. For example, in an article in the January 2013 issue of Landscape Architecture Magazine highlights the power of Flickr. Members of the popular photography website can geo-locate their photos, and that data has been analyzed to help better visualize sight lines to Half Dome in Yosemite. This technique could be applied to any data sets of images of a place geo-located on Flickr. Identifying sight lines though Flickr could help to improve land use/planning and the relationship between people, landscape, and the built environment. A pen and paper has always been a designer’s best friend, but in the last 15 years or so, AutoCAD and its affiliated programs have allowed landscape architecture professionals to explore the profession and designs in greater detail. AutoCAD is no longer just about the 2D experience. Seeing designs in 3D is now the norm and we are getting instant feedback on designs with rigorous parameters. Along side that, the program Revit shows the nuts and bolts of how (in both 2D and 3D) architectural elements work with the landscape, like a project site’s topography with swales. From there, designers are using other programs like Maya and 3D Studio Max to bring projects to life through renderings and animations. Big data sets can be applied to renderings to compare a site’s relationship with the elements of our environment and how it may change over time. And now AutoCAD also provides integration with GIS in its data mapping program Map 3D. With a plethora of software programs available to landscape architecture professionals, CAD’s ability to integrate multiple platforms and programs will always make it a designer’s new best friend. The future of landscape architecture is likely to combine tried-and-true intuition and design-sense with data-driven research. With astronomical amounts of data being generated every second, how might the profession evolve along side big data? 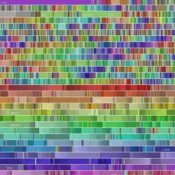 This series has shed some light on what big data is and what impact it has on the process of design and landscape architecture. Big data plays a large role in our lives whether we acknowledge it or not. It is all around us. In Part One of this series we covered the surface of what big data is and its role in our daily lives. Part Two will start to look more closely at big data and its plethora of applications, most notably in the world of design. The above image is a design being printed on a 3D printer at Autodesk Gallery Design Night. 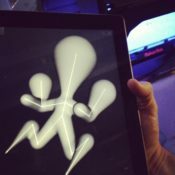 An example of the design process becoming increasingly digital. What do the cash register at the local grocery store, your friendly ATM machine, and your smart phone have in common, besides being electronic (and nonexistent as little as 20 years ago)? They are collectors of big data–and they usually do it without you even knowing. This data increasingly benefits the process of design. Design, from product design to landscape architecture, is quickly becoming a digital experience as feedback is more and more often provided instantly. As we continue to rely on technology in the design process, it goes hand-in-hand with big data. Most if not all of the information that is considered big data comes from a digital source. An example would be software programs that use information to help designers better understand their environment in real-time, while another is your cellphone being used as a moving sensor. Known as crowd-sourcing, companies can tap into your mobile sensor, and provide information like traffic times and geographical information. Big data is helping us to design better products, places, and cities that function more efficiently. This discussion about big data and design wouldn’t be complete without a mention of social networking sites. The ability to disseminate information to people all over the world has become so simple. Spotify, Pandora, Netlix, Facebook, Twitter, Flickr, Instagram, and other sites have become the bread winners in the realm of big data. Within each coded tweet, status update, and image posted, data is being crunched to help better solve human and environmental problems. This is where design can flourish. Enter geographic information systems (GIS) and geodesign. The latter was a topic of discussion recently here on Land8. Check out 2 Books on Geodesign to read more. Of course the very ideas of Geodesign and GIS have a landscape architectural legacy. Ian McHarg, as early as 1964, envisioned that computers would one day manage his data overlays with great efficiency. GIS is not itself “big data,” but it can use all this information being collected by phones and cardswipes and put it to work. Case studies conducted by GIS industry behemoth ESRI show that access to environmental and scientific data is more important than ever. This information allows us to make more critical decisions during the design process. A stable foundation of geographic and scientific information, says ESRI, “extends our analytical capabilities to automate the calculation of hazards, risk, sensitivity, capacity, proximity, accessibility, and other factors to inform design decisions.” Bringing technology, science, and analysis of statistical information into the design process has been a revelation, and all without compromising the art of design. GIS and big data together are helping to build and develop stronger designs. A city that has implemented big data is Santander, in northern Spain. A program known as SmartSantander has major tech companies salivating. The city has placed some 12,000 hidden sensors across the city that measure everything from air pollution to locations of free parking spaces. Sensors monitor the city like a giant smart-home, and can let Santander personnel know which dumpsters are full, or can automatically dim street lights when no one is around. With information like this available, design of not only a city, but design of products on a human scale can evolve more quickly to better reflect the needs of people. Design can’t occur without feedback from the user. So in closing, how can design research improve so the built environment and products of industrial design continue to improve? Its a question that may not have an answer at this time, but will be provided as time passes and new technologies and ideologies are developed. Over time, big data and design research can deepen our understanding of human behavior, interaction and preferences, bettering our designs and our ability to understand and predict their impact. Every day, we create 2.5 quintillion bytes of data — so much that 90% of the data in the world today has been created in the last two years alone. This data comes from everywhere: sensors used to gather climate information, posts to social media sites, digital pictures and videos, purchase transaction records, and cell phone GPS signals, to name a few. This data is big data. The colorful image at top depicts word usage on Wikipedia, as users add text. IBM’s Visualization and Behavior Group create these diagrams as a way to visually process the information. But what does it all mean? Do Facebook posts and Flickr pics actually tell us anything? This three-part series will consider those questions. Part One provides an introduction to big data, while Part Two explores the impact of big data in our society today with an emphasis on design. Finally, Part Three shows the relationship of how big data is or can be implemented in the multi-faceted profession of landscape architecture. The process of translating large quantities of information and analyzing that data began most notably in 2000. Hal Varian, currently Google’s Chief Economist, started a process to study the amount of information flowing through Google searches. Searches and generated online histories are known as “digital breadcrumbs.” This trail of data that we all produce has proven to be profitable for businesses, politicians and governments, and numerous other market segments. Varian’s study ultimately created Google Trends, which shows the top searched items on Google. More importantly, it shows us the immense store of information (and power) that our digital lives create. The internet, of course, has been a big reason for the increased growth of big data. When coupled with our ability to go mobile and remain connected to everything through our smart phones, tablets, and laptops, big data grew exponentially. With our lives on display through social media and the constant need to be connected, big data will continue to be a significant part of our lives, for better or worse. With a general understanding of big data, we can start to see the magnitude of it and the role we play in creating this abundance of information. If you are wondering what this has to do with design and landscape architecture, the next two posts will focus at length on those areas. Check back soon for Part Two, as we delve into the multitude of design applications for big data.